When many consumers buy a Galaxy phone, they aren't choosing Android, they are selecting Samsung. I know what you are thinking -- isn't that essentially the same thing? Actually, no. You see, for many, the operating system is largely inconsequential. When buying a new Android phone, they don't want HTC, LG, or even Google's own Pixel. Instead, these folks must have a Galaxy -- nothing else will do. Samsung's brand loyalty is quite remarkable, and it is possibly only surpassed by Apple. I mean, heck, even after Samsung sold phones that literally exploded and caught fire, consumers have continued to purchase the company's products. It's not hard to see why -- its phones, tablets, televisions, washing machines, and more are an absolute delight. Its Galaxy phones in particular are well-designed and take class-leading photos. Today, Samsung is sure to make many excited, as it has started to send out press invitations to witness the unveiling of the Galaxy S9 at Mobile World Congress in Barcelona, Spain. 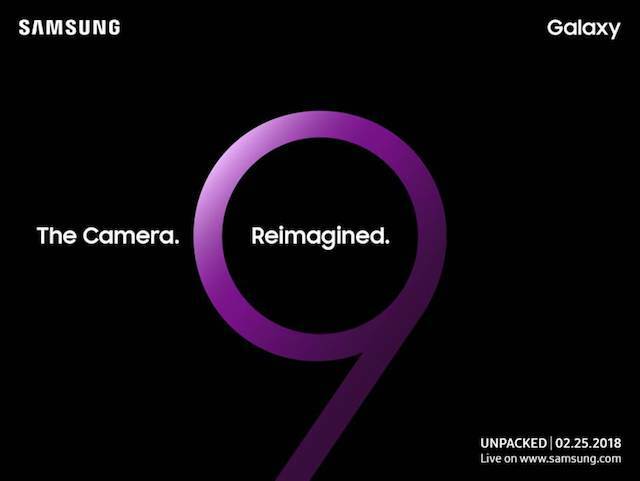 Technically, the company hasn't specifically used the words "Galaxy S9" in the invitation, but as you can see in the image above, it does contain a giant number nine. It isn't hard to figure it out, folks! On Sunday, February 25, we will undoubtedly see the Galaxy S9 -- and probably more too. What's really intriguing, however, is the tagline of "The Camera Reimagined." Clearly, Samsung is going to focus heavily on the camera with its upcoming flagship. This is a wise move, as for the most part, smartphones are fast enough and thin enough. Where consumers will always welcome an improvement, however, is with photo and video recording. After all, it literally captures your precious family memories. Quite frankly, many Android manufacturers still produce smartphones with woefully deficient cameras. It is mind-boggling that some companies think consumers will overlook disappointing camera quality these days. Samsung has the opportunity to pull even further ahead of the pack in this regard. With that said, exactly what the "reimagined" camera will actually be remains to be seen. Are you excited for the big Samsung Galaxy S9 reveal? Tell me in the comments below.